An additional door, installed outside an exterior access door, that provides insulation and damage protection during inclement weather. Full-view storm doors usually have an interchangeable glass window panel and screen window panel to use depending on the season. You must physically change these out. Retractable types have a screen that rolls up into the storm door frame when it is not being used. Ventilating storm doors have two glass panels that adjust up or down to reveal the screen. Roll Screens are a cross between the full-view and ventilating versions. In terms of price, self-storing doors tend to be the least expensive, followed by multi-vent panel doors. Full-view glass is generally the most expensive option. 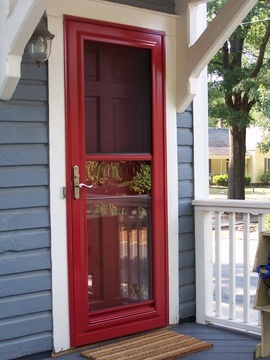 Storm doors average between $125 and $400, with labor costs for installation ranging from $75 to $125.